Traditional style makes you to remember or describes the theme of old style. It is decorated with antique furniture and gives a classy feeling. It creates a natural environment in the interior. Here are few images of kitchen room of traditional style which will helpful in designing your kitchen interior. 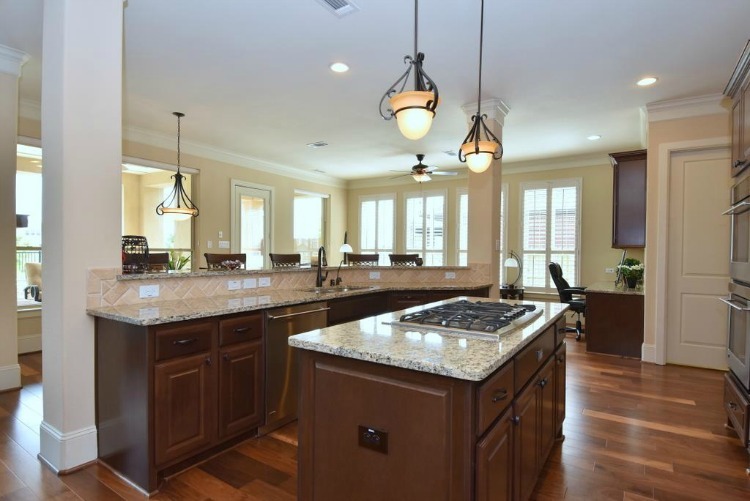 The kitchen room includes furniture such as cabinets, counters, chimney, stove and kitchen ware. The room is decorated with hand made fabrics and looks sophisticated. The cabinets are designed with flat panel and has a micro wave oven on the counter or inbuilt in the cabinets. The interior is covered with draperies for traditional look. In the view of the image you can see a traditional style kitchen room and the cabinets are ivory white. The kitchen is I shaped kitchen with flat panel cabinets for storing groceries and the false ceiling is pop ceiling with recessed lights and has a candle chandelier attached to the roof of classic style. The counter has stainless steel accessories, electrical appliances, stove with a kettle on it, ceramic jar with whisk and ladles. There is an curved island with a faucet and is decorated with fruits and ceramic bowls. There are bar chairs for seating and the flooring is made of laminated wood. This image by its appearance tells you its a traditional style kitchen room. The room has several cabinets and can store all the groceries and kitchen ware and the flooring is made of laminated hardwood. The false ceiling is dry wall ceiling with the simple light fixtures and a metal chimney is attached to the cabinet which makes the room oil and smoke free. The room has inbuilt micro wave oven and has island made of wooden cabinets used for preparing food. There is a refrigerator in the kitchen room. The false ceiling is dry wall ceiling with triple hanging pendant lights and the flooring is made of concrete finish. The kitchen is open kitchen which is adjacent to the living room. The room has wooden wall cladding and a chimney is attached to the roof. There is a modern island decorated with the vases and glass plates. 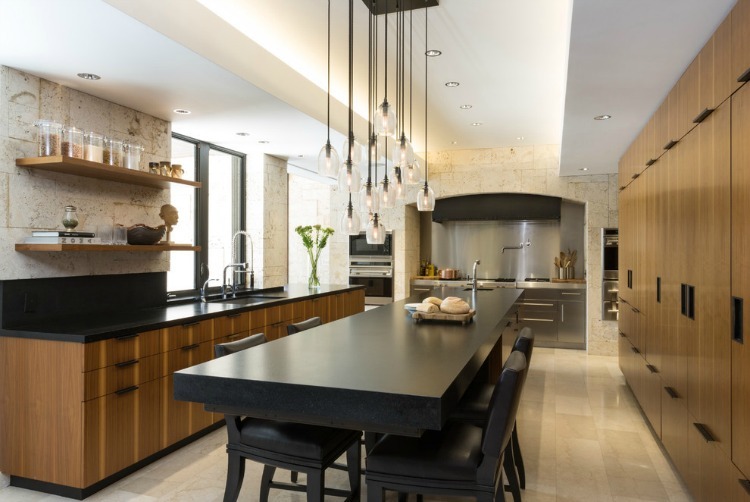 There are glass with black framed cabinets in which glass jars, ceramic bowls are stored and the counter has stove, faucet and stainless steel utensils. The room has bar chairs for seating and has a floor lamp. The false ceiling is dry wall ceiling with recessed lights and has textured ceramic tiles. There is a chimney attached to the roof which acts as an outlet and has an inbuilt micro wave oven. In the interior the dark blue cabinets are eye catching and makes the room beautiful. This is an open kitchen and is suited for small spaces. The room has counters with faucet, sink, stove and island is attached to either side of the counter which can be used as a dining for consuming food or drinks. There is a wall cladding made of wood decorated in the interior. 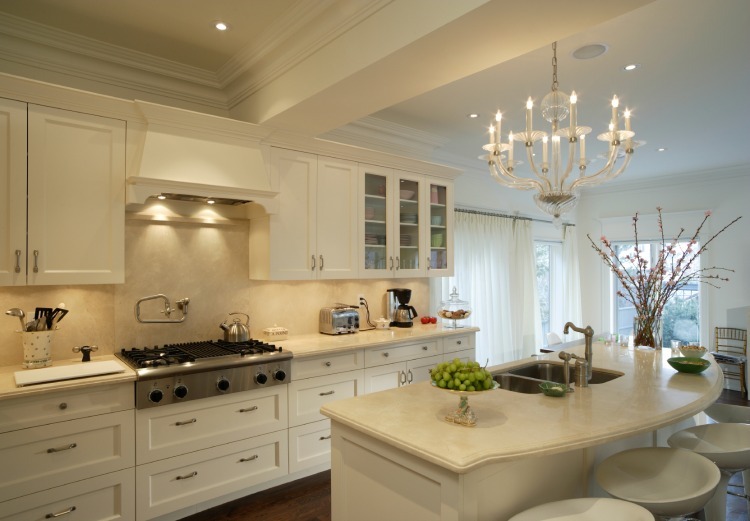 This image views a traditional kitchen room and the false ceiling is dry wall ceiling with light fixtures. 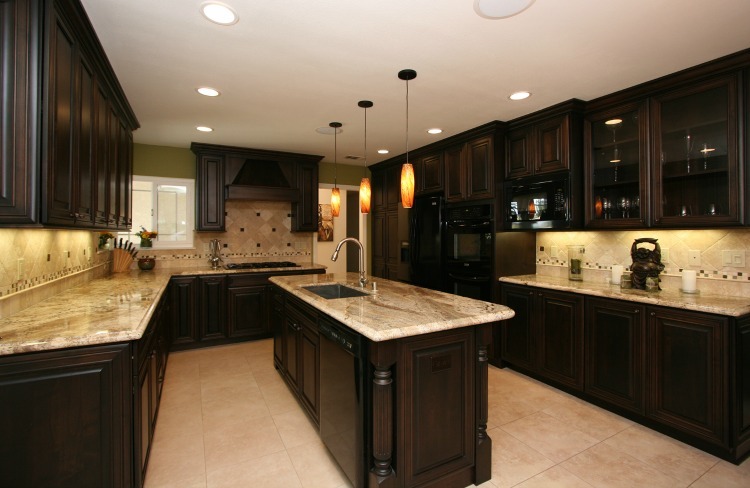 The flooring is made of laminated dark wood and the kitchen is I shaped. There are dark brown counter tops and has a chimney attached to the roof. There is a dining in the kitchen which would be easy for serving. The dining is rectangular in shape with wooden leg chairs and has cabinets for storage. The dining has a sink, faucet and is decorated with fruits and edible items. There is a inbuilt micro wave oven and has counter with ornamental plants and a television is mounted on the wall for entertainment. The false ceiling is dry wall ceiling with simple light fixtures and has modern vintage pendant lights attached to the roof. The flooring is made of laminated hard wood and the interior is decorated with white blends. This is an I shaped kitchen with flat panel cabinets and has a counter with faucet, sink and has a counter with chairs which can be used as dining. The room has an island with stove and has a table with chair for doing work. 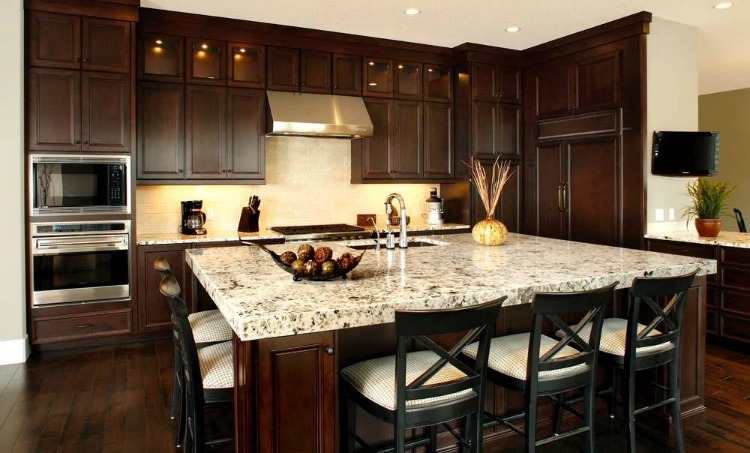 This is an open kitchen and is small space kitchen decorated with cabinets. In the view of the image you can see a stunning modern kitchen room. The false ceiling is dry wall ceiling with recessed lights and the flooring is made of ceramic white tiles with glossy look. This model of kitchen can be designed in small space also and the interior is decorated with textured tiles. There are wine glass chandeliers attached to the roof. There are brown cabinets on one side with black counter and has faucet and sink. Above counter there are closets which are used to store accessories and kitchen ware.There is metal paneling on one side and has inbuilt micro wave oven. There is a dining table which is long and has casement windows. The false ceiling is made of ply wood which has tongue and groove planks with simple light fixtures.The flooring is made of laminated dark wood flooring and has windows covered with valances. The room has white flat panel cabinets to store accessories and has ceramic ginger jars in glass cabinets. The interior has inbuilt oven and has refrigerator.The room has an island which has storage to store messy things and has faucet, sink. It can also be used as dining with chairs for seating. In the view of the image you can see a traditional kitchen room and the false ceiling is a dry wall ceiling with simple light fixtures. The flooring is made of ceramic white tiles and the room has casement windows which makes the room fresh. The walls are decorated with tile cladding and has a wooden chimney which makes the room free from oil and smoke. The kitchen has small space but there are plenty of cabinets with an island which can be used for preparing food and has faucet. The cabinets are made of timber and glass where we can store all the kitchenware. In the view of the image you can see a kitchen room which is simple and the false ceiling is a dry wall ceiling. The kitchen room has a dining table with wooden leg chairs which could be easy to serve. The kitchen is L shaped kitchen which has brown cabinets to store groceries and a chimney attached to the roof. The flooring is made of textured ceramic tiles and the counter has a stove, sink, ladle, whisk, glass door kitchen cabinets and an inbuilt micro wave oven.